One thing is clear from the article: At every point in a product’s lifecycle from manufacturing to post consumer disposal, there are opportunities that we can all seek to improve these numbers. According to the story, in addition to $11.4 billion of wasted recycling opportunities, the U.S. does not stack up well right now in terms of its progress with, for example, aluminum cans recycling. “More than 40 billion aluminum cans are still dumped annually into landfills in the U.S.” Even at 40 million that number is overwhelmingly large. What actions can we take to improve this number? What can we as businesses do to make a difference? On a micro level, we can all reduce that number if more businesses and residences as well as public entities invested in recycling products and backed them with effective signage and messaging to promote green recycling. This combined with increased responsibility on the part of individuals and manufacturers in their manufacturing processes can make a difference. Glaro Inc. has long supported environmentally sustainable recycling initiatives through its leadership in manufacturing American made recycling receptacles and related messaging/signage. Glaro Inc. continues to aggressively expand its recycling lines to help ensure that facilities across America and abroad are properly equipped to make their recycling programs as effective as possible. 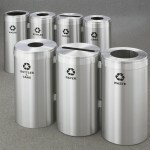 In combination with other recycling practices, the use of recycling receptacles can help bring the number of unrecycled aluminum cans and wasted resources down to a minimum and surely reduce the over $11 billion in waste this article discusses. For more information on recycling receptacles, visit Glaro Inc. here.